Before you take that stack of old games to the donation station, there are few items you might want to recycle into something beautiful and artistic. I love to keep recycle old Dominos and make them into pretty keepsakes. Sometimes they make cute little personalized gifts as well. You might not have dominos, but this project idea might just inspire you to recycle other game pieces into coasters, magnets and other treasures that you can keep for yourself or give as gifts. Make sure you wipe your domino pieces clean, so that there is not dust or crudy stuff on them. 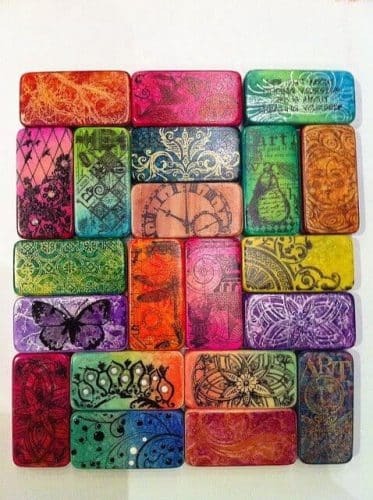 Take a lighter ink color and use a rubber stamp that could act as a background pattern. Think stripes, circle or just use a Q-tip the smear a light ink color on the domino. This should be dry after a minute and then you can more on. Take another rubber stamp that you want to be your main or dominant image dip it in darker ink. Stamp the domino. If there areas that need to be filled in or corrected, use a Sharpie. You can also just stamp a pattern onto the domino piece and fill in the lines with different colored Sharpies. If you don’t have Sharpies you can use your stamp ink and a pointed Q-tip. To decorate the domino piece even more, you could also use stickers, glitter glue or any other crafting items that you might have around the house. and make them into greeting cards or decorative magnets. Other game items that can be recycled include scrabble pieces, dice and game boards. Be creative and always recycle.